Home / Blog / Environmental Sustainability / Awakening the Desert! Olive trees planted in the midst of arid areas within Israel, such as the Negev Desert, have been proven to be highly beneficial for the environment, for animals, and for human health. These resilient evergreen trees are not too picky about their surroundings, are known to thrive in extreme weather conditions, and once established, require little care. They are also beneficial in reducing CO2 levels in the atmosphere, as well. Olive tr ees in the desert also attract and provide protective shade and cover for deer and other desert-dwelling wildlife, as well as provide a safe haven for the millions of migratory birds that traverse these arid regions throughout Israel each year. These trees provide excellent shelter for many animals, primarily because they do not require pesticides or other human care. Recent scientific studies have shown that the quality and chemical makeup of olive oil produced from the groves grown in the desert regions of Israel was of excellent quality with greater health benefits, due to an elevated percentage of antioxidants contained within. Amongst the great environmental advantages in cultivating olive trees in the arid regions of Israel, is that olive trees reduce wind and soil erosion in the desert. Olive trees may be a sustainable solution to creating an environmental oasis in the desert, and also provide economic and social forms of income, as well. 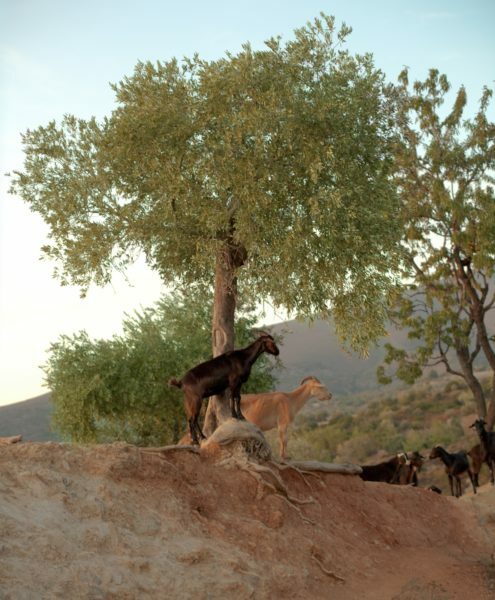 The desert is a delicate, yet harsh environment and olive groves can be beneficial to a greater variety of wildlife. With proper planning, olive groves in the desert are easily being assimilated into the environment. While numerous My Olive Tree partners have generously sponsored a sum total of over 20,000 olive trees throughout Israel today, we hope to continue our efforts in awakening the deserts… one tree at a time! At My Olive Tree, your investment does more than just cover the expense of planting a tree in Israel—it covers the expense of caring for it for its first seven years until it becomes healthy and mature. We have partnered with farmers and locals to carefully tend to your adopted tree so that it will have everything it needs to grow quickly and produce healthy harvests for many, many years to come. If you would like more information on how you can sponsor your olive tree in Israel, please visit us online at www.MyOliveTree.com. Thank you!